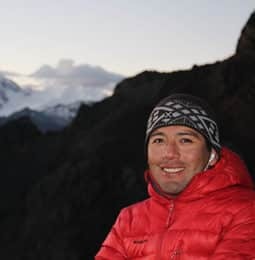 Climb the Nevado Pisco in 4 days in company of Quique, a local IFMGA mountain guide who knows the Cordillera Blanca perfectly. I am happy to organize this 4-day ascent up to the summit of the Nevado Pisco, at 5972 meters of altitude. The Nevado Pisco or the Mataraju mountain is a peak of the Cordillera Blanca. It lies in the Yungay province and is part of the Peruvian Andes. 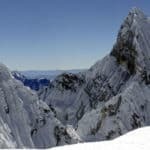 The first climbers to reach that peak were George Kogan and Nicole Leininger. When they summited it they celebrated with Pisco, the national drink of Perú. That is why the Mataraju mountain is known today as the Nevado Pisco. The Pisco mountain is an ideal summit for beginners as well as for experts. Anyway, I always recommend a prior acclimatization through the Santa Cruz and Llanganuco trek. The Ausangate trail is another good option. Once you are at the top of the mountain you’ll enjoy an unforgettable 360º panoramic view of the famous group of summits. All of them are more of 6000 meters high! If you want more details about this program, feel free to contact me and ask me all your doubts. It will be my pleasure to help you conquer the Nevado Pisco summit! IFMGA/UIAGM - AGMP Mountain Guide from Perú. I began my mountain work when I was 18 years old as cook and carrier (porter) and I am now a Mountain Guide UIAGM – AGMP. 1998: I studied French at the Alliance Française in Cusco. 2000: I was accepted at the Don Bosco School for Guides of the Andes through the intermediary of the Italian volunteers of the Operazione Matto Grosso, technical support of the Association of the Mountain Guides of Peru. 2005: I passed my diploma as Mountain Guide UIAGM-AGMP. Climbing in Patagonia and Tierra del Fuego, Argentina. 2008-2011: Extra training as a Guide in Italy. Since 2011, I have been Secretary of the of Peruvian Mountain Guides Association. 2013: Guiding in Ecuador, Cotopaxi, Chimborazo, Illinizas. 2014: Climbing to Utah, Usa. 2015: Exploring trip in Cordillera Central, close to Lima, Perú. I speak French, Italian and English fluently. For more than 12 years I have been organizing and managing trekking, mountaineering in Peru and expeditions to the Aconcagua since 2007. Contact me if you are interested in doing a mountain trip to Peru!